Flavor Text: "If you can see one, then you are already surrounded." Worst card in the game? Gotta be Top 10. Worst? That's a pretty low bar. Sill, this card would be respectable, but probably unplayed at cost 3, and wildly undercosted at 2. And surely there are plenty of other cards out there over-costed by between 1 and 1.5? Yeah, it's probably not the worst, but I don't think Top 10 worst is out of the question. 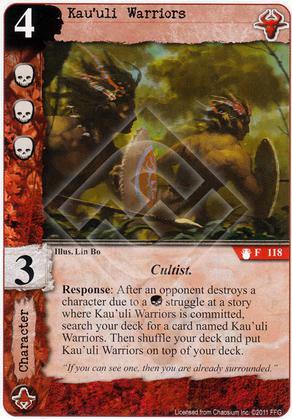 If the Kau'uli Warriors cost 3, that would obviously help, but you still have a ton of things wrong with them. The Warriors will often need a posse to come with them - one friend to absorb the Terror struggle, and another friend to die from combat. That is, if the Warriors' redundant combat icons don't keep you from losing the combat struggle in the first place. Such a conflicted card. The topper to me is that it fetches another Kau'uli Warriors rather than any Shub character, so you can eventually have lots of combat icons on the table and very little else. And the Warriors they fetch don't even go into your hand - you still have to draw them on your next turn. I'd much rather have Gibbering Soul or even Jaguar Warrior. I think many of the worst cards in the game are probably 4+ cost characters. Jacques Artois, Mr. Ngambe, and Professor Smith are also terrible without really the potential to become good in specific decks built around them. The response can only trigger when you win a combat struggle, which the character gives you a decent shot at. But as you say, the effect is kind of disappointing. Given it's high cost it should definitely have at least fetched to hand, not to the top of deck. No, it says the opponent has to destroy a character. You have to lose combat in spite of all the skulls you have on your side. And it's even dependent upon destruction through combat. A Khopesh wouldn't even trigger the effect... Because that would be OP? If you got to fetch another Warriors by winning combat, that would help this character a ton. Maybe this card was a joke when they first started printing it, but then they forgot to stop the printers and it just went out like this. Ah, I can see why you would think that and why it would make the character seem even more unattractive - it would be a remarkable anti-synergy with itself. But from the rules: "the player who loses a Combat struggle must immediately choose one of his characters (committed to that story) to take a wound, if able." Assuming this wound kills/destroys something, which it usually does, it is the loser that has destroyed a character due to a combat struggle. Since the response needs the opponent to be doing the destroying, we want to win the struggle for this Response to have the chance to trigger. And if it triggers we can get another combat heavy guy to help us win more, which is almost useful. Okay, that makes more sense then, even if it's a bit counter-intuitive. That definitely helps this card. It's still weak, but it's no longer horrendous. Thanks for the clarification. Combine this with Halflings of D'haz... you will know what is on top fast.